Licorice is an ancient extract that is used extensively in a variety of industries. It is commonly studied in the medical field because it naturally contains a substance that affects many biological pathways in the human body. In particular, natural licorice heavily impacts cortisol, commonly known as the stress hormone. Its influence on cortisol may change how you feel about this popular candy and flavor additive. Cortisol is a steroid hormone excreted by the adrenal glands, which are at the top of each kidney. It serves a variety of functions and is essential to optimal health. Most commonly, cortisol is recognized for its role in stress responses and the metabolism of fats, carbohydrates, and proteins. Increases in the secretion of cortisol during periods of prolonged stress often result in stalled weight loss and excess fat storage around the abdomen. In some cases, secretion can be extremely high or extremely low. These conditions are often associated with disease states such as hypopituitarism, Addison's disease, Cushing's syndrome or adrenal tumors. Licorice is an age-old extract from the roots of a five-foot shrub known as Glycyrrhiza glabra, commonly found growing in Europe, the Middle East and Western Asia. Licorice has a multitude of uses in the food, tobacco and medicinal industries. Natural licorice contains glycyrrhizic acid, or GZA, which is known to have dangerous side effects when consumed on a regular to frequent basis. In the United States, however; a majority of food items flavored by or containing licorice do not contain GZA, eliminating the associated health risks. Although licorice produced or sold in the United States does not contain GZA, it is important to be aware of how some licorice supplements or licorice obtained from foreign travels can affect your health. The GZA substance found in natural licorice enhances cortisol production and action. GZA deactivates enzymes that keep cortisol levels balanced, causing a cascade of reactions that disrupt your body's delicate balance of essential ions. Sodium retention substantially increases, while potassium and hydrogen ions are excreted in excess. The results are significant spikes in blood pressure, muscle spasms and a disturbance of the acid-base balance in the body's tissues. Discontinuing consumption of licorice and GZA will reverse these symptoms. Frequent consumption of licorice may be hazardous to healthy individuals, but for patients suffering from Addison's disease, it is just what the doctor ordered. Addison's disease is a rare, and sometimes fatal, condition symptomatic of impaired cortisol production. In a 2007 report in the "Annals of Clinical Biochemistry," a woman unknowingly stricken with Addison's disease staved off its fatal effects with a steady "diet of licorice sticks and soy sauce." 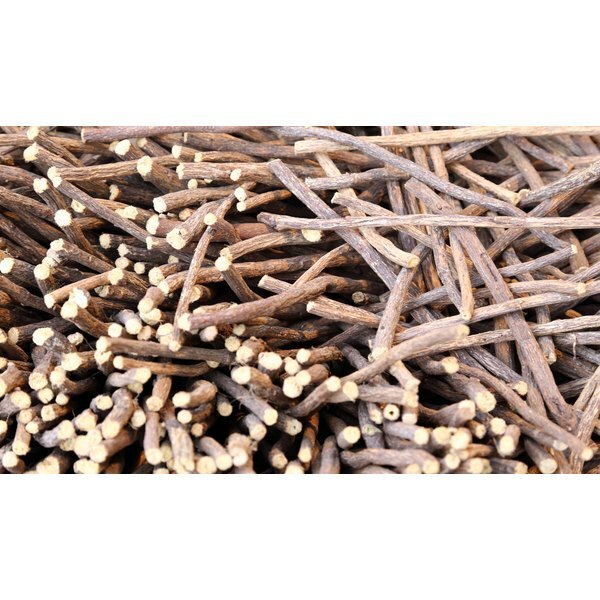 Modern medicine has replaced this "creative" method of self-treatment through the use of synthetic compounds that essentially mimic licorice's natural effects on the adrenal system. Based in Florida, Danielle C. Tworek covers health news and medical topics for various online publications. She is a certified personal trainer with the National Academy of Sports Medicine, as well as a Schwinn indoor cycling instructor. Tworek holds a Bachelor of Science in human nutrition.